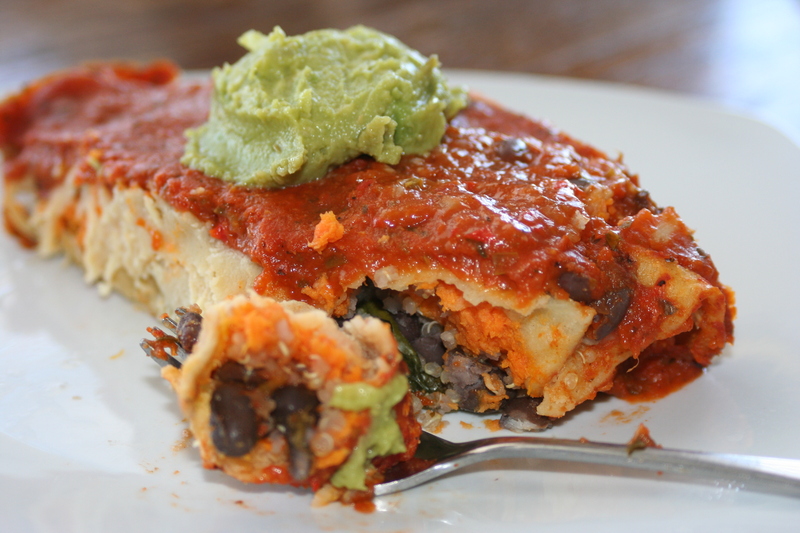 Last night I tried my hand at making vegetarian enchiladas from Nourishing Meals. I did make several changes to the recipe, but the essence of it doesn't belong to me. I love enchiladas and these were delicious! The made-from-scratch enchilada sauce is incredibly tasty and not too labor intensive. While topping them with cheese would be amazing, we just went the route of guacamole (my husband is sensitive to dairy, so we in general avoid it). Preheat oven to 400° F. Grease 9 x 13 glass baking dish. To make the enchilada sauce, heat a 3-quart saucepan over medium heat. Add the oil, onion, jalapeno, and bell pepper; saute for 7 minutes, or until softened. Add the garlic, spices, and salt; saute a few minutes more. Then add the water and tomato sauce or diced tomatoes. Cover and simmer for about 20 minutes. Pour sauce into a blender, add arrowroot power or cornstarch; blend until smooth. To make the enchiladas, first be sure to heat up each tortilla so they are pliable for filling and rolling. Lightly grease a hot skillet; heat each tortilla for about 10 seconds on each side. You can fill one enchilada while the next tortilla is heating. Add a few small spoonfuls of mashed sweet potato, then beans, and finally a small handful of spinach leaves. Roll tightly and place the filled tortilla seam-side down in the greased baking dish. Repeat with remaining tortillas, pushing the filled enchiladas closely together. Once the pan is filled, top with the sauce. Cover and bake for 30-35 minutes. Garnish with guacamole. I love the Whole Life Cookbook but hadn't heard of Nourishing Meals. I will definitely see if my library has it. I'm so glad you posted this! Yum. I want these. I haven't had enchiladas in over a year. But I can't have BEANS, in addition to gluten, dairy, etc., etc., which makes it difficult. Do you have any ideas for what I could substitute for beans? Meat, I suppose. But what else? Or would that suffice? Thanks! Lana, I didn't realize you were sensitive to all kinds of beans; I thought it was just one or two kinds you could not eat. Anyway, for substitutions: Meat would work, of course. However, if you're interested in keeping these enchiladas vegetarian, then I'd suggest a Mexican spiced saute of chopped mushrooms, bell peppers, and onions. The protein content wouldn't be as high, but I think they would still be filling enough and the flavor would be great. Hope that helps. for the reason that this this website conations actually nice funny data too. I'm glad I randomly stopped by and found 2 posts! During the initial stages of Phen375's market life, many people try different buy raspberry ketones programs that work for men. A lot of times it's difficult to get that "perfect balance" between user friendliness and appearance. I must say you have done a fantastic job with this. Also, the blog loads extremely fast for me on Opera. Outstanding Blog! It's going to be ending of mine day, but before ending I am reading this fantastic paragraph to increase my knowledge. You're so interesting! I do not believe I have read through a single thing like this before. and yours is the greatest I have discovered tilkl now.